Lean Thinking: Lean Production Simplified -- 10 Year Anniversary! 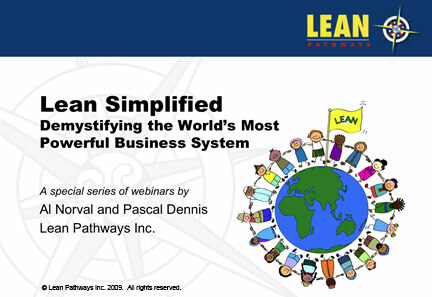 Lean Production Simplified -- 10 Year Anniversary! Ten years ago I got a strange desire to write down all I'd learned about the Toyota Production System. Partly to explain it to myself, partly because clients were asking for it, and partly because I just wanted to. Anyhow, the result was Lean Production Simplified -- a Plain Language Guide to the World's Most Powerful Production System. To my surprise, the book found an audience, won a Shingo Prize for Excellence, and is still going strong. When I have a question, I still refer to the damned thing. "That makes sense," I'll say to myself. "Why didn't I think of that?" A few years back, my colleague Al Norval, and I, decided to make a series of webinars based on the book. Our Lean Simplified Webinars have also, happily, found an audience and proved to be helpful. In any event, we'd like to celebrate the 10th anniversary of Lean Production Simplified with a series of special offers! Look for them in the weeks & months to come! Thanks for sharing your experience and many are getting the benifit of learning lean. Hope to see more such books. Thanks for the kind words, Chalapathi. New book will be released this spring. Reflections of a Business Nomad -- Stories & Poems from the Road. Book is about Leadership & Ethics and reflects these past 12 years helping companies around the world.